Individually, Henry Paker and 2008 newcomer nominee Mike Wozniak are two of the most widely-tipped new stand-ups, meaning a lot of anticipation among seasoned circuit-watchers about this collaboration. Thankfully, they don’t disappoint. The Golden Lizard, which scooped best show at the Leicester Comedy Festival earlier this year, is a bizarre adventure tale in which the best alphabetiser Reading library ever employed goes on a globetrotting mission to track down the mysterious scientist Floyd Vernon, for reasons largely irrelevant. A large cast of characters is invoked using just a cap, a pair of sunglasses and a pince-nez to represent the three key protagonists. A necessary device as – in an innovation born of necessity – the pair don’t stick to the same roles throughout. It’s a typically idiosyncratic touch for a show that’s rife with them. The elegantly well-honed script frequently throws up laugh-out-oud moments through its exquisite (mis)use of the English language, from Vernon’s deranged ideas about science – postulating, for example, that maths is far too complicated and could make do with a lot fewer numbers – to the joyous list of bizarre items being packed for a trip to Bolivia. 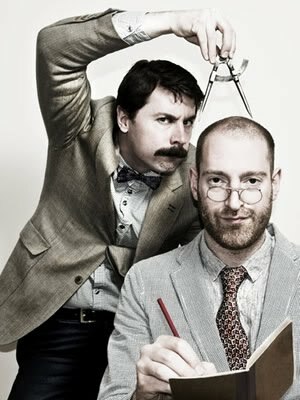 But although gracefully twisted writing is their forte, the duo also bring a skilful physicality to their performance, especially Wozniak whose soft face and generous moustache cut a fine comic image. Mostly, the laughs come from playing preposterously silly scenes absolutely straight. The only drawback is the paper-thin plot, which you might not think important in such a piece of nonsensical frippery, but more substance would sustain the interest in a way loosely linked standalone scene don’t. But there are more than enough beautifully strange turns of phrase and moments of surreal inspiration to make this a quest worth embarking upon.